A federal judge in Bridgeport on Tuesday ruled Norwalk physician Dr. Bharat Patel will continue detention at a federal prison in Rhode Island. The decision came at a bond hearing for the 70-year-old physician from Milford, weeks after he was one of two doctors charged in a federal criminal complaint that accuses him of writing illegal prescriptions, money laundering and more. 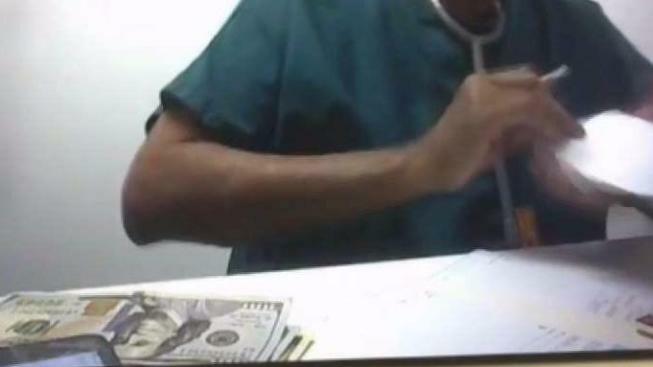 Also in court, Assistant U.S. Attorney Rahul Kale presented a 12-minute video clip of what appears to show Patel writing prescriptions to a confidential source and seen handing over what appears to be $100 bills for five separate scripts. The video, according to federal agents, was obtained in March 2017. Regarding that clip, Judge William Garfinkel announced, "it does show a stunning callousness and disregard for the law," prior to making his decision. "If he were to be convicted, and facing possible consequences, he could be spending the majority of his remaining years in prison," the judge added. Patel’s attorney Dan Wenner argued that the 70-year-old physician should be released on a $1.2 million bond package with equities from properties owned by Patel’s friends and family. In court, Wenner responded to the video shown, stating "a lot of content was reflected in the complaint. We are certainly not here to dispute the claim. Keep in mind, the dangerousness to a community standard, in terms of bail is not designed to punish Dr. Patel on past conduct. He is not a risk or danger to the community. Dr. Patel’s ability to commit the crimes he’s accused of doing is dependent on having a prescription pad." "If he doesn’t have prescription pads, there’s no way he could continue whatever kinds of crimes the government is accusing him of," Wenner said. Reiterating to the judge, Wenner said his client would not be a danger to the community, nor would he be considered a flight risk. The prosecutor and Patel’s attorney worked their way through his financial assets, retirement package from John Hancock and the amount the other doctor in the case charged in the criminal complaint provided Patel every month: $10,000. Kale also announced in court that a grand jury was taking place on Wednesday. Garfinkel addressed his concerns regarding allegations made against Patel’s wife. A prosecutor last week stated in open court, that Patel would leave prescriptions for his patients, after hours in the liquor store she once owned in the same Norwalk strip mall. This same claim Patel’s brother denied to the NBC Connecticut Troubleshooters. In court, Garfinkel announced his concerns about Patel’s wife and either potential involvement or willingness to look the other way. Patel’s family and friends did not wish to comment to NBC Connecticut after court. Wenner did not wish to comment after court, in addition to what he put on the record at Tuesday’s bond hearing.